Hugh Padgham is possibly one of the few producer 'names' that members of the public would know, possibly due to the vast range of artists that he has worked with for the last thirty years. The catalogue is huge. From Genesis to McFly, Hugh Padgham still has a fresh and vital style that keeps him current and in demand. A brief round up of the artists that Hugh has worked with includes: David Bowie, The Bee Gee's, Paul McCartney, The Police, Genesis, McFly, Mansun, Sheryl Crow, Elton John, XTC and many, many more. We managed to prize Hugh from behind his SSL console at his new private London studio to ask about his recent work and of course, how he created that trademark Phil Collins drum sound. After watching our video feature we are sure that you will agree that one of the reasons that Hugh Padgham remains firmly in demand is his relaxed and disarming personality that helps artists feel at ease and give their best in the studio environment. We are delighted to bring this broadband video feature and would like to thank Giles Stanley for making this feature possible and George Shiling for his in depth questions! For further information about Hugh Padgham please visit his website and also check out the excellent Jan 2006 issue of Resolution magazine. 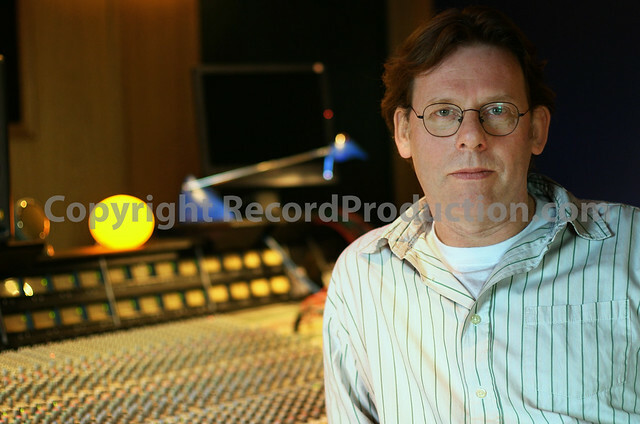 Hugh Padgham is among the most successful music producers in contemporary rock and pop, best known for his extended collaborations with Phil Collins, Sting, Genesis and The Police. Hugh enjoyed a #1 single in March on the UK BBC-1 charts with a wonderful remake of "Islands In The Stream"(Mercury/Universal), for the BBC's Comic Relief Charity. This song features Tom Jones as well as the British TV sensations Vanessa Jenkins and Bryn West. Hugh produced the debut release by London sensations, Lo-Star. Previously, Hugh was in with Dani Harmer, British TV sensation, producing her debut release for Universal Music. Padgham's career began during the early '80s, at which time he served as a recording engineer on high-profile projects including Peter Gabriel's third solo LP ("I Don't Remember," "Biko" and "Games Without Frontiers"), XTC's Black Sea and Yes' Drama. In 1981, Padgham produced and mixed The Police's triple platinum Ghost in the Machine ("Spirits in the Material World," "Every Little Thing She Does Is Magic" and "Invisible Sun") and Phil Collins' 5x platinum Face Value ("In The Air Tonight" and "I Missed Again") while recording Genesis' double platinum Abacab ("No Reply at All", "Abacab," "Me and Sarah Jane" and "Man on the Corner") as well. Ten million units sold in one year! Padgham reunited with Collins the very next year to produce and mix the two-time Grammy-winning Hello, I Must Be Going!, XTC's critically-acclaimed English Settlement ("Senses Working Overtime") and Split Enz' finest album, Time and Tide ("Six Months In A Leaky Boat"). Hello, I Must Be Going! sold 3 million units and featured the singles "I Don't Care Anymore" and "You Can't Hurry Love". Padgham also found time to mix Hall and Oates sizzling #3 Billboard album, H20, including the hit singles "Maneater," "One on One" and "Family Man". Following up shortly thereafter with his production on The Police's 8x platinum Synchronicity ("Synchronicity," "Every Breath You Take," "Wrapped Around Your Finger," and "King of Pain") and Genesis' 4x platinum Genesis ("Mama" and "Illegal Alien"), Padgham solidified his position as one of the most sought-after producers in the world. With David Bowie's 1984 platinum effort Tonight ("Blue Jean"), The Human League's Hysteria ("The Lebanon") and Adam Ant's Strip ("Puss N' Boots"), Padgham enjoyed another great year, but '85 was going to something amazing altogether! Padgham and Phil Collins' returned with double success stories: Collins' 12x platinum, Grammy-winning Album of the Year blockbuster No Jacket Required, which featured the #1 Billboard single "One More Night," the #2 Billboard Single, "Take Me Home," as well as ""Sussudio," "Who Said I Would," and "Don't Lose My Number" and, later that year, the Stephen Bishop-penned #1 worldwide smash single, "Separate Lives," a duet with Collins and Marilyn Martin from the platinum-selling original soundtrack to the film White Nights. After wrapping up work on Genesis' 1986 6x platinum Invisible Touch ("Tonight, Tonight, Tonight," "Land of Confusion," "Throwing It All Away, and "Invisible Touch"), Padgham worked with Paul McCartney on Press to Play, Howard Jones on One To One and Chaka Khan on Destiny. Nineteen Eighty-Seven brought Sting's double platinum Nothing Like The Sun, which Padgham co-produced and mixed, featuring "An Englishman In New York," "Be Still My Beating Heart," "We'll Be Together" and Sting's incredible version of Jimi Hendrix' "Little Wing". During 1988 Padgham mixed Brian Wilson's simply brilliant, heart-rending ballad ,"Love and Mercy," from Brian's first solo album, Brian Wilson, Julia Fordham's self-titled debut, Julia Fordham, and Julian Cope's My Nation Underground, featuring smashing covers of the old Shadows of Knight gem "Someone Like Me" and The Vogues fantastic "Five O'Clock World". Phil Collins and Padgham returned to force in 1989 with his 4x platinum ...But Seriously ("I Wish It Would Rain Down," "Another Day in Paradise" and "Do You Remember?"). Padgham also produced Julia Fordham's critically-acclaimed Porcelain that same year. In 1990, Padgham mixed Suzanne Vega's Days of Open Hand, the Peter Gabriel/Youssou N'Dour track, "Shaking The Tree," from Youssou N'Dour's The Lion album, and, later, produced Rag N' Bone Buffet by XTC. In 1991, Padgham reunited with Sting on his platinum The Soul Cages ("Mad About You" and "All This Time"), Michelle Shocked's Arkansas Traveler, his third album with Julia Fordham, Swept, David Bowie/Tin Machine's Tin Machine II, and Phil Collins' fantastic take on "Burn Down The Mission" and Sting's memorable "Come Down In Time" found on the platinum Two Rooms: Celebrating the Songs of Elton John & Bernie Taupin. Sting's triple platinum Ten Summoner's Tales ("Fields of Gold," "If I Ever Lose My Faith in You," "It's Probably Me" and "Shape of My Heart") reached #2 on the Billboard charts and won Padgham a Grammy for Best Engineered Recording. Padgham produced and mixed Melissa Etheridge's 6x platinum smash album, Yes I Am, featuring her mega-singles, "I'm the Only One" and "Come to My Window". "Come to My Window" won Etheridge her second Grammy for Best Female Rock Vocal Performance. Next up, Padgham worked again with Collins on Dance Into the Light and with Sting on the platinum Mercury Falling. To close the 90's, Padgham went on to produce two very different, very wonderful releases: Clannad's lush Lore album and 311's Top Ten gold release, Soundsystem. Padgham's worked with The Tragically Hip on In Violet Light ("Are You Ready" and "Silver Jet"), Vanessa Carlton's platinum release, Be Not Nobody, Zucchero's' Zucchero & Co., Scumfrog's Extended Engagement and Simmer and the 2007 Grammy-winning Best Pop Instrumental Album, Peter Frampton's Fingerprints. The most well-received Padgham release of recent years is McFly, the Brit pop wunderkind that amassed Four Top Five UK singles from their #1 UK debut album, Room on the 3rd Floor, including Two #1 UK hits, "5 Colours in Her Hair" and "Obviously," a #2 UK single, "That Girl," and a #5 UK single "Room on the 3rd Floor". Padgham then produced McFly's sophomore effort, Wonderland, a second straight #1 UK album that contained Four Top Ten singles including another Two #1 UK hits, "I'll Be O.K." and "All About You," a #3 UK hit, "I Wanna Hold You" and a #9 hit, "Ultraviolet/The Ballad Of Paul K". Padgham's produced and/or mixed albums and singles that add up to well over two hundred fifty million units sold worldwide. He's won 4 Grammy Awards including Producer of the Year, Album of the Year and Record of the Year as well as a Brit Award for Best Single (Phil Collins' "Another Day In Paradise"), a Music Week Award for Best British Producer, a TEC Award for Outstanding Creative Achievement and Mix Magazine's Top Ten Influential Producers of the Mix Magazine Era.